Harried, embattled, and under pressure to deliver results, police officers tackling extremism and terrorism must look for allies. What better choice, one might argue, than Sufi Muslims. Many Sufi imams preach peace, love and tolerance. Sufis also tend to oppose fundamentalist Salafi Islam quite strongly. They undoubtedly loathe the terrorists of Islamic State and al-Qaeda. Indeed, terrorists incensed by this stance repeatedly target them in brutal attacks on their gatherings and shrines in Pakistan. But there can be a sting in the Sufi tail when it comes to some of Pakistan’s prominent clerics. Defending the honor of the prophet is the highest of callings in their world. Those who do dishonor the prophet in certain Sufi eyes will face ardent opposition. At worst, the offenders should be killed, and if they are the killers will be praised in the name of Islam. Surely there can be no better example of extremism than supporting murder merely for the victim’s words. If there are to be red lines, this must be one of them. The latest international chapter of this story has just unfolded in the United Kingdom. On 12 July 2018, two officers of the Greater Manchester Police (GMP) attended a “Counter Terrorism Conference” organized by the Ramadhan Foundation and were given an “award”. The star turn was the Pakistani preacher Muhammad Hassan Haseeb ur-Rehman, who does indeed oppose the terrorism of Islamic State and al-Qaeda. From the left: Inspector Bash Anwar, Chair of the Greater Manchester Muslim Police Association; Russ Jackson, Assistant Chief Constable of the GMP and a senior officer of Counter Terrorism Police North West; Muhammad Hassan Haseeb ur-Rehman; Mohammed Shafiq of the Ramadhan Foundation; and Labour MP Afzal Khan. Now have a look at ur-Rehman at home in Pakistan. In an agitated address, he salutes Mumtaz Qadri as a “martyr of Islam”. A big picture of Qadri hangs on the wall behind him. Qadri is the religious fanatic who assassinated the Pakistani politician Salman Taseer in 2011. 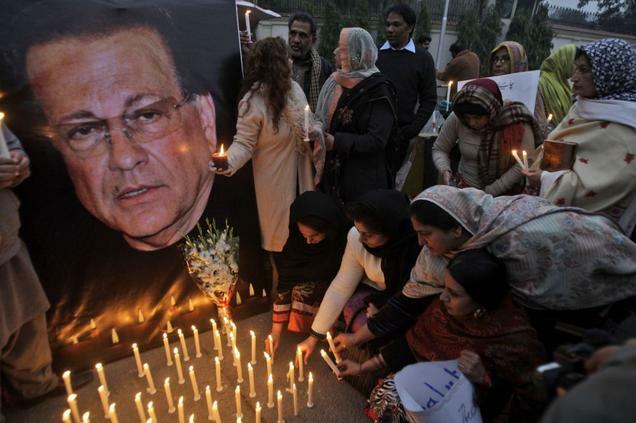 Taseer’s “crime” was criticism of Pakistan’s controversial and frequently abused blasphemy laws. This entirely legitimate and much-needed call earned him 27 bullets from Qadri. Qadri was subsequently tried for murder, found guilty and executed by Pakistan in 2016. And here is ur-Rehman firing up the angry crowd at Qadri’s funeral. In another clip filmed just after Qadri’s execution, ur-Rehman can be seen praising Qadri as a “martyr of Islam” once again. He also calls Qadri an “aashiq e rasool” (lover of the prophet) and urges people to come to the funeral to show their support for the assassin. Ur-Rehman also met Mumtaz Qadri’s brother in Dubai in 2015. On this occasion, an “official” Twitter account run by his students called Qadri a “ghazi”, or hero. Salman Taseer speaking up for Aasia Bibi, a Pakistani Christian persecuted under Pakistan’s blasphemy laws. Taseer’s son, Shahbaz, 33, who was recently freed after being kidnapped and held captive by Islamists for four years, criticised British authorities for allowing the clerics into the country. “Firstly they are not preachers. A preacher in Islam is a person who spreads the message of Allah, just like the Prophet, through peaceful means. You cannot force your view on someone else. This is the basic foundation of Islam,” he told IBTimes UK in an emailed statement. It is Shafiq’s words that are absurd, coming as they do from a man who has long been known as a problem to liberal British Muslims. His Ramadhan Foundation operation is about self-promotion as a “community voice”, but the “community” he really represents is his own ideas and interests and he has a long record of promoting extremists. For example, the Foundation defended the notorious hate preacher Yusuf al-Qaradawi as a “voice of moderation” after al-Qaradawi was banned from British shores in 2008. A decade on, Mr Shafiq has not learned or changed and probably never will. “The Counter Terrorism Conference was an event organised by the Ramadhan Foundation and representatives from Greater Manchester Police were invited via the Muslim Police Association. At the event there were a number of speakers, including a Bishop, a Rabbi, academics and bereaved family members of a victim of the Manchester terror attack. The media were also present at the conference. The Labour MP Afzal Khan did not respond to a request for a comment from EER. The GMP, Afzal Khan and others should do better. Wearied liberal British Muslims need all the help they can get. When even police officers and MPs lend legitimacy to their opponents and known extremists, liberals cannot be blamed for losing hope. Perhaps useful lessons will be learned from this episode. Better late, even far too late, than never.